Welcome to Asbury Park Bazaar's Meet the Maker AP series where we highlight local artists and makers of the Asbury Park Holiday Bazaars being held Saturdays & Sundays, noon to 5 pm, in the Grand Arcade of Convention Hall in Asbury Park. Today's #MeetTheMakerAP is Tali Peritore of Simone Meir Vintage Textiles. Tali is a vintage collector with an eye for detail who takes passion and pride her work. Her collection consists of vintage clothing, accessories, home goods, and fabric swatches. 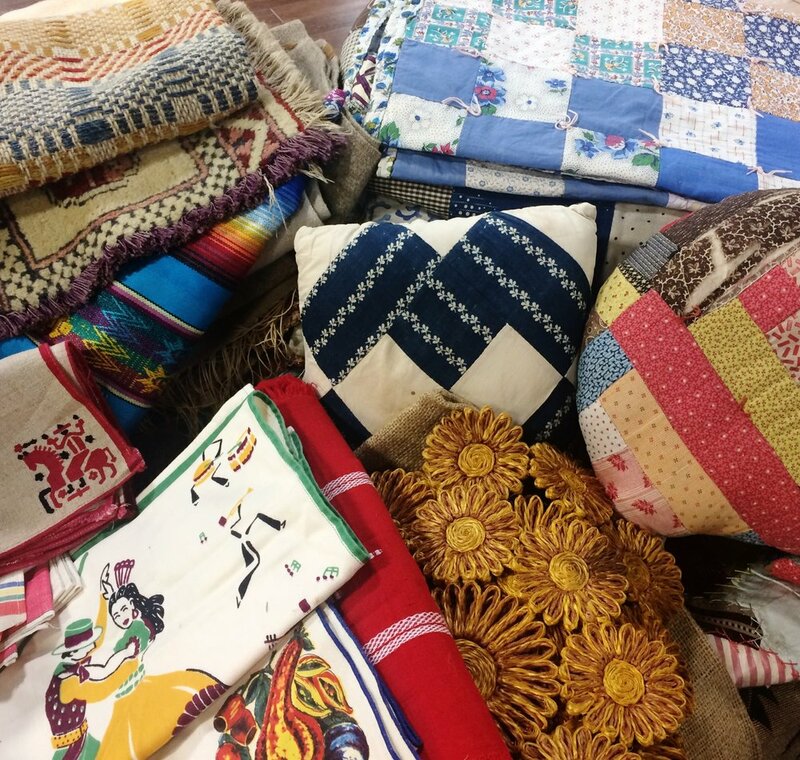 We're excited that Simone Meir Vintage Textiles will be at the bazaar this Saturday, December 17th! Come peruse her awesome collection of vintage treasures...shirts, cozy sweaters, holiday dresses, outerwear, coveralls, military, and more. I had a career in fabric research and development for a global apparel company for 12 years. I always loved the fabric and trim I developed, especially the vintage ones that I would find while hunting for goodies at flea markets. After I had kids, I needed a career that was more flexible than the 9-5. I always loved vintage clothing and swatch companies that would come to our office for inspiration, so I decided to start one knowing that I would base my work meetings and trade shows round the needs of my kids. 2) What is your motivation behind collecting and selling vintage? I would say it's the love of the HUNT!! Finding treasures in piles, bins, and cardboard boxes is probably my biggest motivator. I keep plastic gloves and a head light in my car, you never know when you will need to get your gear for digging. 3) Where did you grow up and where do you live now? What's your favorite part about living there? I grew up in Brooklyn and now live in Freehold. I love freehold!! After living in Brooklyn for so many years I love that Freehold feels like the country. It's green, the houses have more land to run around on, and you can usually run all your errands in 30 minutes because there is no congestion. The only problem I see is that I forgot how to parallel park! Total chaos. My collection consists of Vintage Clothing, Accessories, Home Goods, and Fabric Swatches. My "studio" is ALL OVER my house with rooms that I use for storage and rooms that I use to clean, fix, and then edit the collection based on my next venue or meeting! My days usually consist of getting the merchandise, sorting it, then getting it ready to show. 5) What are you most looking forward to at the Asbury Park Holiday Bazaar? I love action!!! A big crowd of people coming in and out of booths with treasures! Talking, laughing, and drinking...I can't wait! 6) What kinds of products will you be offering at the bazaar? Vintage apparel consisting of women's and men's wear, men's vintage shirts and lots of cozy sweaters, women's holiday dresses and outerwear, vintage workwear coveralls and vintage military that can be worn by anyone. 7) Why should people support events like The Asbury Park Bazaar, and shop small and local during the holiday season and all year round? Shop for items that were found and made with passion and pride. If you shop small you are supporting your community, your neighbors, your family. My kids are still small so lighting the Hanukkah Candles with them is a lot of fun and getting to do it for 8 days is even better! I just have to fight my son so he doesn't blow them out right after he lights them...it's not like birthday candles! Be sure to stop by and say "hi" to Tali and shop her fantastic finds and vintage goods at the Asbury Park Holiday Bazaar this Saturday, December 17th.